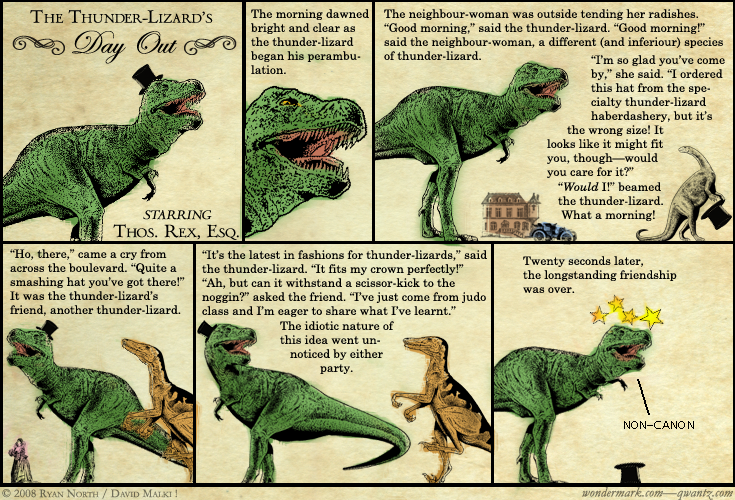 Dinosaur Comics - October 13th, 2008 - awesome fun times! guest week 2008: david malki ! of wondermark! Monday: David Malki ! of Wondermark! Tuesday: John Campbell of Pictures For Sad Children! Wednesday: Kate Beaton of Kate Beaton's Comics! Thursday: Anthony Clark of Nedroid! Friday: Randall Munroe of XKCD! I am super excited to see what these people come up with, and I already know what they came up with, and they're that good that I'm Still Excited. I hope you enjoy! And please consider this a personal recommendation to check out these strips if you haven't already: they're each and all fantastic. One year ago today: friday fun verificationism comics!